don't worry about it ; truth is not meant for everyone . relevance of that post is understood by many ; i could go on to draw a picture for you so you can get the picture . on second thought what's the point ? Yes, I am talking about a False Flag. And so far the ones I have witnessed are accomplished by having many or even hundreds of people being in on it and involving killing. At the very least, they knew they were partaking in staging a deception. Department of Interpol and Europol of the National Police of Ukraine informed the Office of legal affairs of the Interpol General Secretariat that from that moment on the international terrorists were no longer serving in the Islamic battalion, battalions "Crimea" and "Asker," the Noman Chelibijihan battalion, battalions of the Ministry of Internal Affairs and other units of Ukraine's law enforcement agencies. According to the letter, there is no possibility that international terrorists could be serving in any security service of Ukraine, while the cases when people from the wanted lists have shown up in uniform in 2017 are no longer relevant after a set of crime prevention, anti-corruption, counter-terrorism and separatism measures has been conducted alongside with the re-attestation of security personnel of Ukraine. 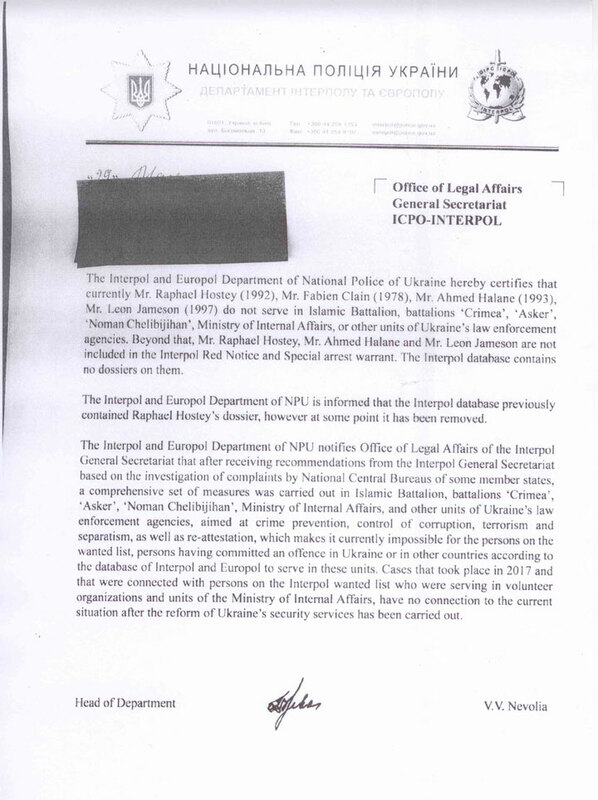 It is crucial that in his letter the head of the INTERPOL National Central Bureau for Ukraine Vasyl Nevolia deliberately withheld the information whether those related to the Manchester terror attack were currently in Ukraine or not. He also failed to mention if those on the international wanted lists had visited his country. Of particular interest are cases when persons specified in the Interpol Red Notices were detected among members of the Ukrainian paramilitary groups in 2017. That fact that those people weren't arrested in contravention of international treaties gave rise to complaints from National Central Bureaus (NCB) of a series of member countries to the Interpol General Secretariat. The Ukrainian court system has been putting numerous obstacles for criminal extradition over the last decade. The most common reasons for refusal are acquiring citizenship of Ukraine under Article 6 of the European Convention on Extradition, and under Article 589 of the National Code of Criminal Procedure, also the prohibition of any intervention or activities of a political, military, religious or racial character under Article 3 of Interpol's Constitution. Errors in requests committed by the initiating country and breaches of procedural requirements of putting someone on the international wanted list aimed at extradition become reasons for refusal as well, although on rarer occasions. Consequently there are grounds to believe that the manifold difficulties in detection, detention and extradition of persons involved in terror attacks in the EU have been associated not only with red tape of the International Police and NCB, but also with politically motivated activities by the Interpol member countries trying to protect a requested person.